One of the evenings last week was especially enjoyable. We drove far north, crossed few little towns (Arbus, Guspini, Sanluri, Las Plassas) and found ourselves in a different subregion. The area located far from the sea differs greatly from where we stayed. Fluminimaggiore is only 7km from the shore and is surrounded by the mountains of about 1000 meter high. A new region called Marmilla was quite different. Its flatness and dryness was what striked most. Rocky hills are left in the south and the whole region is a great burnt plain. Every little hill gave us an opportunity to see far in every direction. Dried fields, olive groves, modest shruberry were pretty much all. After a few kilometres, there was a curiosity: the remains of the volcano that created a regular plain formatted about a hundred meters above the rest of the plains called Giara. Not only being volcanic makes it special: it has been formatted out of basalt few thousands of years ago which made it a surpassing in this dry land a rich reservoir of fresh water. Out of this height four different rivers have their sources and there are many natural wells. 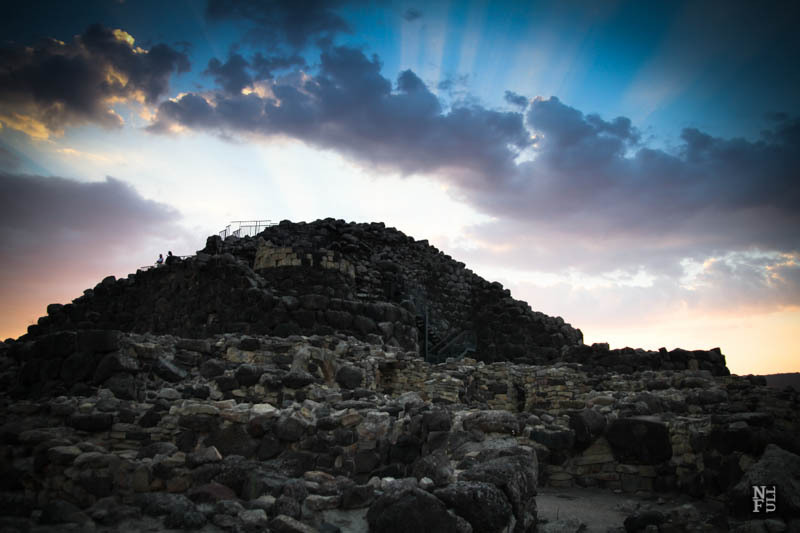 Such unusual natural conditions caused the appearance of a bronze age culture called the Nuragic civilization after nuraghe – a characteristic building remains just like the one below. The Nuragic Civilization had a few distinctive characteristics, however, most of the issues related to their social life and religion is obscure. Many of the scientific theories remain unconfirmed. They were living in a relative isolation for few hundred years and created fortifications and large villages in this area. As Sardinia has been conquered many times throughout of history by a variety of dominate groups like Phoenicians, Romans, Vandals, Byzantine Greeks just to become a playground of powerful kingdoms and duchies in mediaeval and modern times. As a result of such turbulent history, there is an exceptional mix of all elements of the past rulers. Therefore, there is plenty of archeological sites in Sardegna and I wanted to visit at least one of them. We started our journey at 16:00 but until 20:00 it was so hot I could hardly remember of what I saw. We entered an archeological site of Giara accompanied by two little local dogs. The view made us partially sad and partially fascinated with what we saw. The site looks like abandoned many years ago, there was only one wooden board with basic information about the place and the other ruins and remains were left as they were found. There was a road constructed out of basalt, few houses, and a high wall. Although the panorama was beautiful as we were watching vast plain below of a bleach colors, the place was unfriendly. A strong wind made this impression of hostility even stronger. The large part of information about the place came from Cesare, whose master thesis was based on the field archeological research he did more than thirty years ago. He was deeply touched with what he saw and shared spontaneously his own memories. I think the absence of care for this place made him very sad. He looked like a person whose mind was in the same place but trapped thirty years ago and who was trying to make sense out of what he sees. Quite unsuccessfully, I’m afraid. As the heat drained us in a few minutes, we continued our visit by car and visited a small town of Gesturi and further Barumini. Gesturi, a small town, Sardinia, Italy. “During the late 2nd millennium B.C. 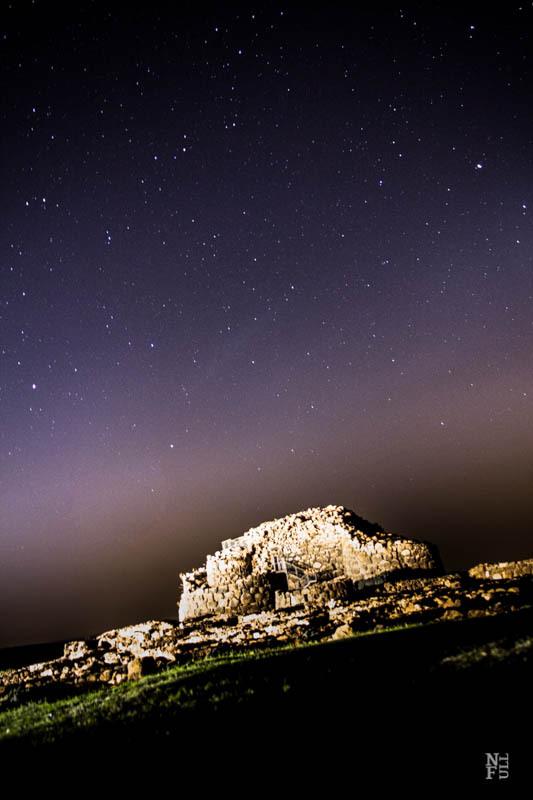 in the Bronze Age, a special type of defensive structure known as nuraghi (for which no parallel exists anywhere else in the world) developed on the island of Sardinia. The complex consists of circular defensive towers in the form of truncated cones built of dressed stone, with corbel-vaulted internal chambers. 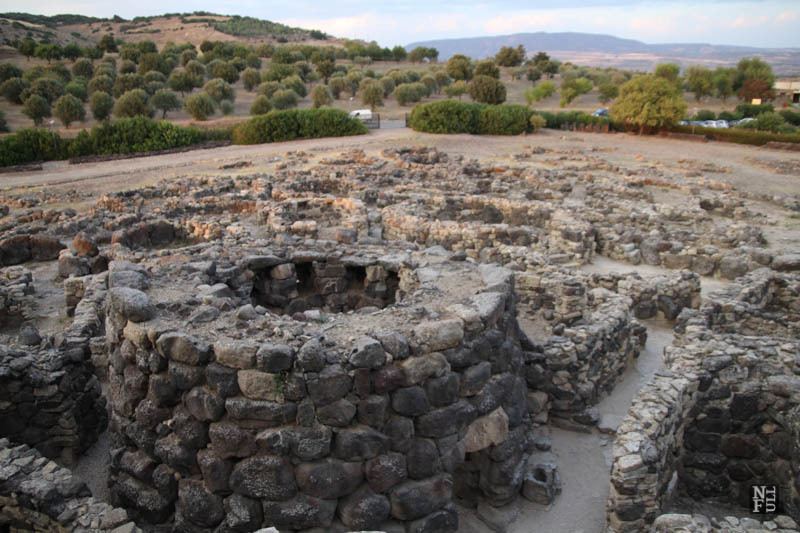 The complex at Barumini, which was extended and reinforced in the first half of the 1st millennium under Carthaginian pressure, is the finest and most complete example of this remarkable form of prehistoric architecture”. First, we stopped at the main square of Gesturi when a local feast was taking place. The square was decorated with color little flags that made a loud noise ruffled by the wind. Old ladies were leaving the church with their hair covered talking in the dialect that is impossible to understand. Their local saint has had 133 anniversary of birthday and so the town was celebrating. Then, we went to visit a must-see place. The UNESCO World Heritage Place called Su Nuraxi di Barumini. Even it was 19:00 in the evening it was still hot. I could hardly understand the guide and eventually gave up. I was just hanging around in the remains left out of the biggest known nuraghe. It was similar to the experience of walking the Pompeii complex though this one was much more modest and primitive. The round houses cuddled together and crouched around the main protective tower looked like little chickens with a hen. The guided visit caught my attention when we entered the tower through a very small passage with unregular stairs only to discover the inner circulation of the air was very limited. I became pale in a second and felt really bad so the rest of the visit I spent sitting on the of the rocks. As I rest a bit I felt better and could ask some questions to the guide. 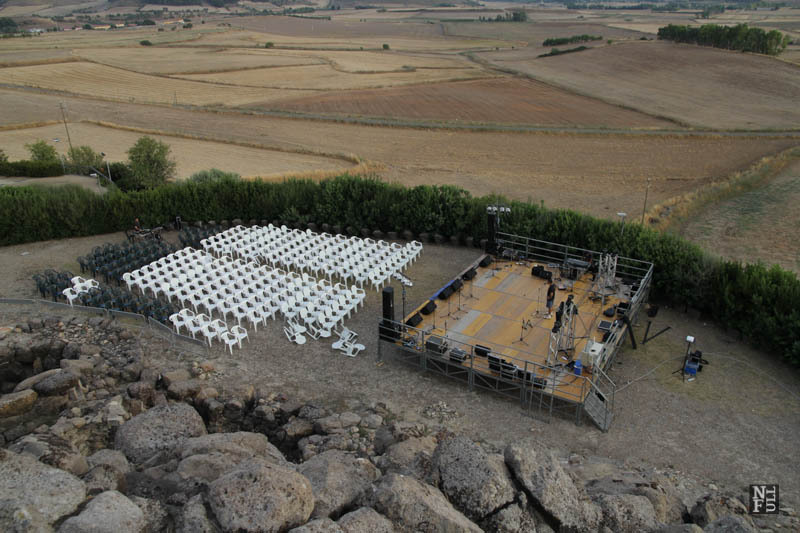 Barumini – a concert preparations. 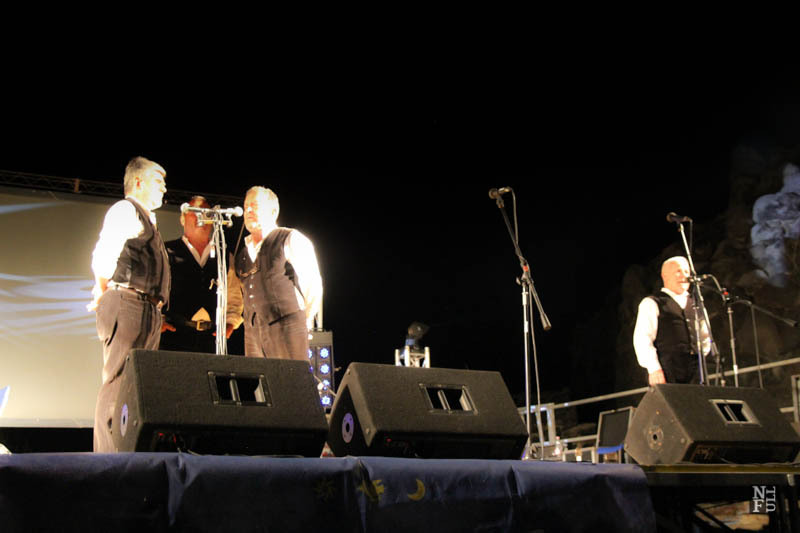 In front of the ruins, there was a concert of the folk music organized by a band from Sardinia. We and a hundred of other people were sitting in the dark and watching an illuminated stage. 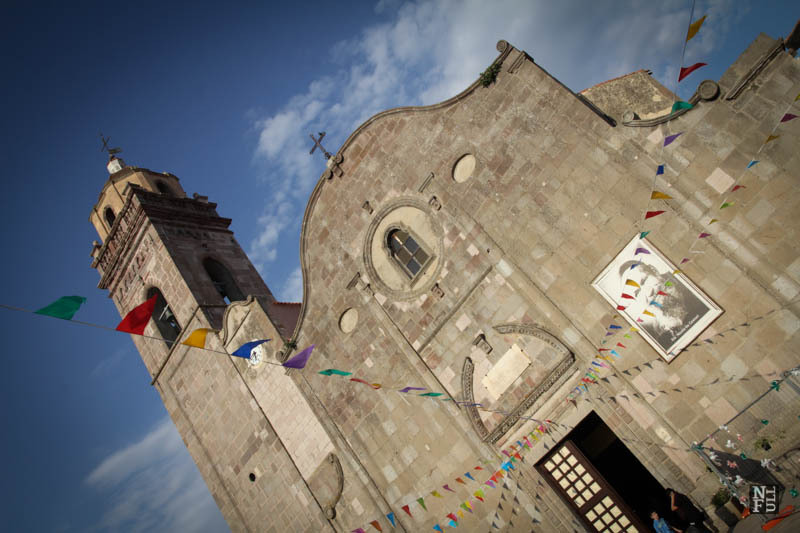 It all started with the first song by Tenores di Neoneli Orlando and Eliseo Mascia – a well-known folk band of international fame. The sound was exquisite as these men performed a throat singing. Barumini, Tenores di Neoneli Orlando and Eliseo Mascia. Their powerful voice was echoed by the oldest ruins in the area and was penetrating our hearts and minds. Simple stories told in their dialect sung with clarity and engagement made an amazing impression on the audience. Apart of a capella singing they also had a triangle, accordion, and a sort of a drum and a traditional flute. It altogether sounded sincere. This is true for an ethnic music of all places on earth. The music strongly connected to the land and people is understood by all others. You do not need any music education to understand the basic emotions enchanted in this music. A simple music piece sung with a conviction of a believer touches deeply every listener. And this makes listening to ethnic music so powerful and at the same time pleasant. Happiness, sadness, love, faith and despair is all possible to sing about and to be understood by the listeners. That night we came back home rich in the experience of the history of Sardegna, everyday life of people who live here and the events that they are most proud of. Next episode is coming soon. Okay, that might be one of the most beautiful places to have as a backdrop to a concert. Thanks for sharing. It was spectacular! I was happy to discover that Sardinia does it quite often. At least in the summer, there is a concert at one of the archeological sites every couple of days. Brilliant idea! I was right there with you at that concert. Music is indeed one of the best if not the best way to connect with a culture. Such a stark contrast to the other experience at the archaeological site. Great write up! The archaeological site looks amazing. I have never heard of it before. Thanks for sharing. Sounds like a spectacular experience – it blows my mind that we have structures still around from the Bronze Age, and I’m so glad that the world has recognized the importance of preserving places like this under UNSECO World Heritage. Must have been amazing to take in a concert among the ruins – folk music is my jam!